Sabi Sabi Bush Lodge combines the excitement of a Big 5 safari with the comforts of modern bush living. 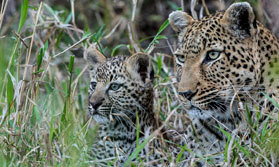 You go on twice daily game drives, setting out early in the morning and again following afternoon tea, with the chance of a late morning walking safari to optimisie your wildlife watching. All safaris are led by experienced game rangers and trackers, keen to share their knowledge and enthusiasm. Between safaris you rest at the lodge, sitting in the lounge with its open sides displaying panoramic views and admitting a cooling breeze. There are shaded deck areas overlooking a waterhole and two swimming pools for refreshing exercise. Staff at the Amani Spa offer a range of therapeutic treatments. Meals are sumptuous affairs based on home cooked South African fare prepared with the freshest of ingredients and includes mouth-watering braais (barbecues). The 25 suites are arranged to either side of the main lodge buildings. Each has a sitting area and features African artefacts and locally made furniture. All are air conditioned, have ceiling fans and an en-suite bathroom with a walk-in shower and full running water. Amenities include a minibar, tea and coffee maker, safe and phone. The 2 luxury villas are the epitome of style with a four-poster bed in the master bedroom, twin bathtubs, an indoor and outdoor shower plus a second en-suite bedroom, and a shaded terrace with a plunge pool. The Mandleve presidential suite is equally opulent and provides accommodation for 2 guests plus their own safari vehicle, ranger and tracker. Sabi Sabi Bush Lodge is ideal for families, and the EleFun Centre offers special activities designed for different age groups, to help them make the most of their time in the bush, learning about the wildlife and environment in a fun-filled atmosphere supervised by childcare specialists. Open: Sabi Sabi Bush Lodge is open all year. Location: Sabi Sabi Bush Lodge is in the Sabi Sabi Private Game Reserve within Sabi Sand bordering Kruger National Park. Sabi Sabi has its own airstrip. Rooms: There are 25 suites including 2 luxury villas and the Mandleve presidential suite. All have en-suite bathrooms with glass shower cubicles, a lounge, tea and coffee maker and minibar and are air conditioned. Other amenities include a safe, hairdryer and phone. One suite is modified for disabled access. Each luxury villa has 2 bedrooms, a large bathroom with twin bathtubs, an indoor and outdoor shower, a second bathroom with a bath and rain shower, a lounge, and terrace with a plunge pool. The Mandleve presidential suite, named after a famous bull elephant at Sabi Sabi, has a large bedroom with an en-suite bathroom and an outdoor shower, and a lounge opening on to a patio with a plunge pool. Guest staying in the presidential suite have the services of a private game viewing vehicle, driver, ranger and tracker. Activities: Morning and late afternoon game drives in Sabi Sand Game Reserve, with guided walks also available in the late morning. Facilities: There are 2 swimming pools and several decks with views of the waterhole. Indoors there’s a lounge with a TV, lobby and bar. There a boma for outdoor dining. The Amani Spa offers a wide range of treatments and is open from 8am till 5pm each day. There is a shop. The lodge has a guest car park. Dining: Breakfast, lunch, afternoon tea and dinner are served each day. The style of food is described by the chef as ‘contemporary African’. Meals are usually eaten with other guests. Children: Children of all ages are welcome. The EleFun Centre offers supervised children’s activities for 2 age groups: 4 to 8 years and 9 till 12.